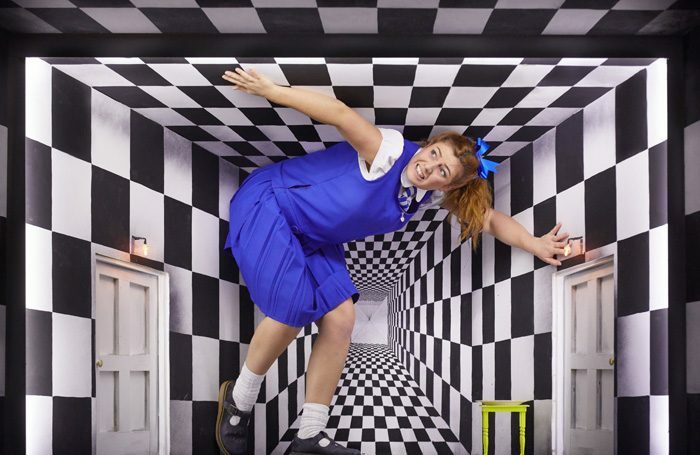 Rachel O’Riordan’s last production as director at the Sherman Theatre is Mike Kenny’s warm-hearted new adaption of Lewis Carroll’s Alice in Wonderland. Kenny reframes it as a story of Alice’s attempts to find herself after trying too hard to fit into other people’s idea of who she is. Lucy Rivers’ accompanying songs range from a lively lobster dance to more heartfelt ballad, are emotionally resonant while also embracing the peculiarities of Carroll’s story. The adaptation also contains several bilingual elements. The all-Welsh company is a musically and comedically gifted bunch. Elin Phillips as both the Caterpillar and the Cheshire Cat gives a standout performance full of mischievous energy. Her comic timing is superb and she plays off the audience nicely. Keiron Self, as the Duchess, gives an uproariously hilarious performance, while Elian West’s Alice anchors the whole piece, making Alice intelligent, sparky and charming. Hayley Grindle’s black and white chessboard set plays with perspective and reveals surprise after surprise. Wonderland seems to spring from every doorway in bursts of colour. O’Riordan’s direction balances the playful elements of the text with an emotional core. The visual imagery in the production is spectacular but it’s there for a reason. Rather than simply embracing the weirdness of the story and exaggerating it, O’Riordan harnesses it. In her hands Carroll’s classic is transformed into an energetic story that honours the original’s oddness, while also feeling relevant for today.